In 2010, Burning Man embraced Black Rock City’s place in the world as a fully-functioning temporary city, one that not only acts as a living model for the dynamics of urban planning, but also as the ultimate Petri dish for experiments in the possibilities of large-scale human collaboration. Larry Harvey’s 2010 art theme “Metropolis: The Life of Cities”, asked participants to contemplate the impact of urban planning and design on community and culture, and to consider how interpersonal interactions fostered by a closely-connected urban environment affect synergistic collaborative potential. There are few – if any – other places on the planet where these are more vividly on display than at Burning Man, earning Black Rock City its standing as one of the great cities of the world. In anticipation of the Metropolis theme, Larry Harvey worked in conjunction with Burning Man’s Communication team to produce Metropol, a multi-part series in the Burning Blog focusing on these questions as they relate to the “default world,” while bringing to light many of the inner workings and decisions that have gone into the planning of Black Rock City over the years. By mid-afternoon on opening day of Burning Man 2010, as the citizens of Black Rock City watched the skies darken with stormclouds rolling in over the playa, the skies opened up, deluging the city with a powerful three-hour rainstorm. Black Rock City quickly became a giant mudslick, and the Playa Operations Team put out the call (via staff radios and Burning Man Information Radio) to temporarily suspend all vehicular traffic. 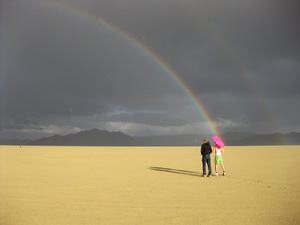 After rainshowers pass through on Monday afternoon, a double rainbow arcs across the playa. Those determined (or delusional) enough to attempt travel slogged through the slippery mud, thick layers of clay-like playa attaching to their shoes (the infamous “playa platforms”) and clinging to and seizing up bike tires. Then, as the rains subsided, and the heart of the storm passed over the city, a strikingly vivid end-to-end double-rainbow appeared and lingered in the eastern sky. Once again, Mother Nature’s art project trumped anything mortals could conjure. At the center point of Black Rock City, people watched this spectacle from the viewing platforms built into the 50′-tall art deco skyscraper on which the Man was perched. Participants enjoying the newly-completed Temple of Flux emerged from its high-walled dune-like canyons to stand and gape in wonder. People came out from under their camp shelters to cry “What does it meeeean? !”, mimicking a popular internet meme of 2010. It was a quintessential “playa moment.” Mutant vehicles stood still. Bikes were rendered useless. People took pause from their work, and from their play, and from their reverie … unexpectedly forced to rethink radical self-reliance. Facing ruined camps, shorted-out wires and trashed technology, participants had to get creative, shift gears, and find a new way to realize their plans. It’s hard to imagine a better way to start the week than with a healthy dose of humility, and being reminded what we’re capable of as individuals, and collectively. At its peak, Black Rock City 2010 had a record population of 51,525 participants – so many that two concentric streets (London and Mumbai) were added to the city mid-week – and yet still, the city felt like a cohesive community. It was notable the ease with which it seemed first-time Burners embraced and embodied the culture. There’s a palpable richness to the cultural mix that is Burning Man, and great energy in its steady momentum. It’s notable that a record high population left behind a record low amount of Matter Out of Place (MOOP) — a result of their Leave No Trace efforts. Of the 275 registered art projects on playa, 36 were honoraria projects funded by the Burning Man art grants program. Iconic amongst the art was Marco Cochrane’s (self-funded) 40′-tall steel female figure “Bliss Dance”, “Infinitarium” by Karen Cusolito and Big Art Studios, Kate Raudenbush’s “Futures Past”, and Bryan Tedrick’s “Minotaur” keyhole piece. The demand for mobile art was at an all time high as, for the first time, the Department of Mutant Vehicles received over 1000 applications for mutant vehicle licenses. About 700 registered theme camps were pre-placed; of these, 626 were theme camps, 39 were villages, and 35 were other camps (art support camps, for example). Amongst these – ranging from the sublime to the ridiculous – were camps for Burners Without Borders (BWB), which offered more interactivity than ever with daily performance and over 75 campers, and District Everywhere, a showcase for Burning Man’s Cultural Network organizations, including BWB, the Black Rock Arts Foundation, Black Rock Solar and the Regional Network. Burning Man hosted its first official gathering for academics, inviting those studying or researching around Burning Man and Black Rock City to participate in an on-playa meet and greet. The invitation was met with overwhelming response and nearly 200 respondents RSVP’d for the event, held on Thursday at the Ashram Galactica camp. All attendees (and those who were unable to attend) were invited to join an ongoing information-sharing and discussion group, forging valuable new connections and potential collaborations within the Burning Academics community, and offering a new page for sharing academic research about the event and the culture at Burningman.com. Organizationally, the Burning Man Project worked throughout 2010 to build a solid foundation and to set its feet more firmly on the ground in preparation for large organizational changes (and challenges) to come in 2011. Burning Man further refined its management structure, including the roles of – and players on – the Black Rock City LLC, the Board, Executive Committee, Senior Staff, BRC Ops Team, and a variety of working Sub-Committees. Simultaneously, work continued on efforts to transition Burning Man into a non-profit entity, and to find a centrally-located San Francisco office space that would accommodate the creation of an urban center – including both private- and public-facing spaces – that will allow the organization to more fully embody its principles in the real world, year-round. The Black Rock Arts Foundation, Burners Without Borders and Black Rock Solar continued to grow their efforts and influence, and given the significant role they play in Burning Man’s future, each has their own report in the Afterburn as of this year. Read their reports for a full run-down of their activities over the last year, and on playa. The worldwide network of Regional Contacts expanded to welcome 27 new representatives – accommodating not only turnover in existing regions, but adding new locations around the world, including the Philippines; Perth, Sydney, and Melbourne Australia; and new domestic outposts in Bellingham, Washington and Nebraska. Local Burner groups everywhere are formally and informally gathering and organizing around their connection through Burning Man, day to day and in thousands of ways all around the world. In an unexpected turn of events, the Electronic Frontier Foundation (EFF) published a sharp critique of Burning Man’s terms and conditions regarding photographers’ rights mid-year. In response, Burning Man’s Legal and Communications Departments facilitated a dialog to flesh out the issues and determine a better framework for this complicated and challenging issue. To help determine where best to draw the line between photographers’ rights and protecting the Burning Man culture from exploitation, Burning Man hosted open meetings and panel discussions at Burning Man HQ, on playa, at the SXSWi conference, and on the Burning Blog. These have culminated in a change to the terms and conditions that will be in place for Burning Man 2011. Burning Man has a very ambitious future vision. 2010 was a foundation-building year, preparing us to face the exciting challenges that await us in the next several years and beyond to realize that vision, wherein we will further anchor the touchstone of Black Rock City, while expanding Burning Man culture around the world. And as we see regularly at the event, as well as in our day-to-day workings, Burners are nothing if not adept at rising to the challenge, adapting to new circumstances, and working collaboratively to determine – and execute – the best way forward. Indeed, this has been the hallmark of the Burning Man experience, and 2011 was a year of refining and advancing toward a greater vision than ever before. The Burning Man Project wishes to express gratitude and appreciation to the staff, volunteers, partners and participants who make Burning Man possible as a result of their passionate dedication to this incredible project.